Automated Teller Machines (ATMs) went online as early as 1974, making them one of the oldest examples of the Internet of Thing (IoT), where sensors or otherwise digitally enabled devices communicate over the internet. With roots reaching back decades, it’s no surprise that the financial services industry is a hotbed of IoT activity. Deloitte analysis suggests one-third of sensors deployed in 2015 were able to be used by financial services institutions. This is expected to reach 50 per cent in 2020. Is a car really only driven to church and back on Sundays, as is claimed, or is the owner an enthusiastic participant in the illegal underground street circuit? Car insurers are starting to collect more accurate data about the vehicles they cover using telematics such as GPS and tracking devices. Premiums can then be offered on a usage-based insurance (UBI) model, where distance driven and driving habits determine the premium. The insurer has a more accurate picture of what they’re covering, while the driver has an incentive to drive safely and is rewarded when they do. The UBI model is already gaining ground, with Business Insider predicting more than 50 million US drivers will have tried this type of insurance by 2020. There’s also the potential to apply it to other forms of insurance, with health insurance premiums that go down when the activity recorded on wearables goes up. If paying less is an incentive to get people moving or driving safely, it might also encourage them to invest in safer homes. Most insurers already offer discounts for security systems and this will expand as smart devices identify potential problems before they arise. If, for instance, a smart smoke and gas detector is triggered, it will also provide information about what has been detected and in which part of the house, allowing quicker action. In addition, smart detectors can even alert the home owner if they are offsite and, if necessary, notify the fire department. When institutions offer loans, they gather a lot of upfront information. After that it can be a leap of faith that they’ll be able to recoup their losses if the borrower is unable to pay. Smart devices can give them a more accurate picture of their loan collateral, such as that required maintenance is being done on the house in the case of a home loan or that a manufacturer has the inventory to keep trading. Insurance and finance operates on a principle of calculated risk that the money or coverage offered is less than what they recoup. When there’s more available data, it’s easier to calculate risk more accurately, but its potential is much greater than that. IoT analytics can help insurers better predict the future and take steps to limit their liabilities. With improved weather forecasting, they can identify customers likely to be affected by damaging storms and text them with advice to put their cars in the garage to avoid a heavy shower of large hailstones. Improving data analysis will help the financial services industry save money by reducing risk, but process changes will deliver further savings. ATMs and internet banking have already decreased the need for physical branches, while online-only insurance companies have disrupted a market that previously saw little change from one generation to the next. There’s scope for greater automation with some property insurers using drones to assess damage claims, increasing speed and decreasing the costs involved in processing them. Consulting firm Cognizant estimates that drones will improve workflow for insurance adjusters by up to 50 per cent. Moving services online made banking more convenient for customers who could now make transactions whenever they wanted and there’s room to further reduce the need to walk into a bank. For example, it’s feasible that IoT technology will instantly notify a customer how much money they can borrow, and at what rate, the minute they step onto a car lot. Now all they have to do is decide whether to get racing stripes. 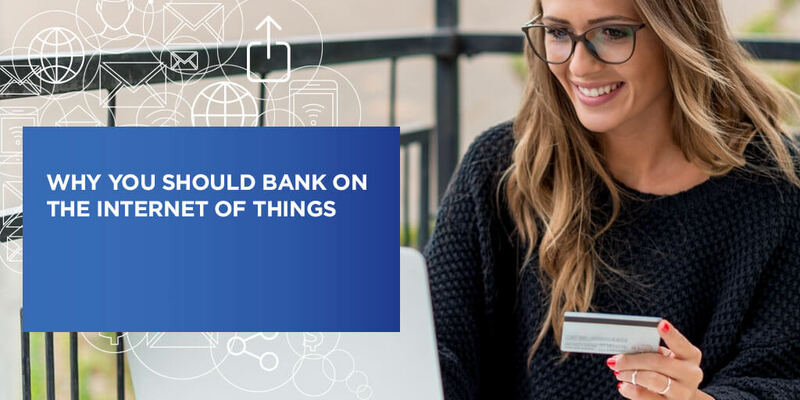 Just as banking and insurance have undergone significant changes to the speed and way they operate since that first ATM was introduced, IoT will redefine the financial services industry by streamlining interactions for consumers and the wider sector alike.